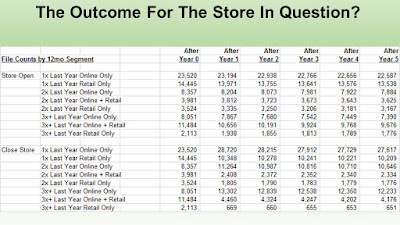 Kevin Hillstrom: MineThatData: How Does The Customer File Evolve When A Store Closes? 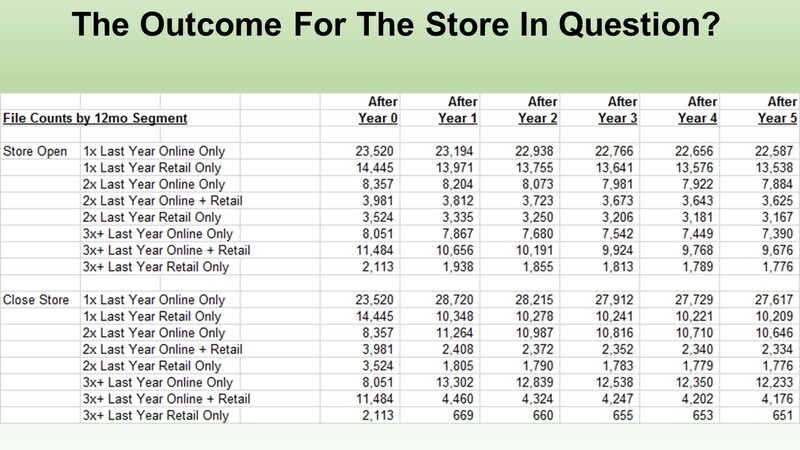 How Does The Customer File Evolve When A Store Closes? Oh, the customer file evolves all right!! Read across the 1x Last Year Online Only rows (open vs. closed). Over time, this segment (already the dominant segment with the store open) becomes even more dominant. And there are plenty of customers who keep shopping in retail once a year even though the store is closed. 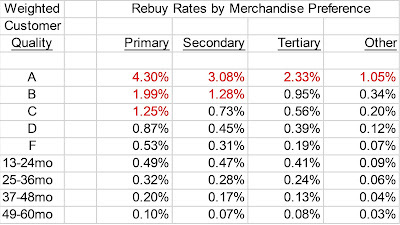 Of course, the loyal retail buyer segments dry up, as expected. Let's dig into a bit of the detail. Here is a 1x online only segment, assuming that the store remains open. If the customer purchases, 45% stay 1x online-only, 11% become 1x retail-only. What happens if the store closes? If the customer purchases, 53% stay 1x online-only, 3% become 1x retail-only. So it's clear that the customer shifts even more online-centric, as expected. If the customer purchases, 18% move to 1x online-only, 35% stay 1x retail-only. But if the store closes? If the customer purchases, 51% move to 1x online-only, 12% stay 1x retail-only. 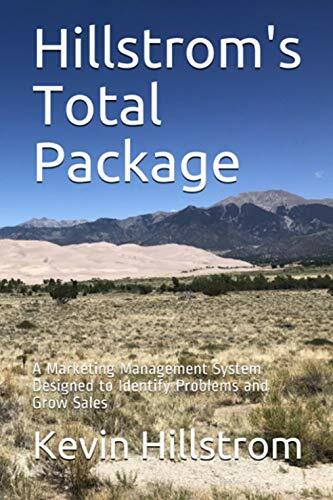 The retail customer falls apart, and if the customer purchases, the customer migrates online instead of driving long-distances to stores. If the store stays open, online customers are 4x as likely to stay 1x online than to become 1x retail. If the store stays open, retail customers are 2x as likely to stay in stores than to become 1x online. The difference in the ratios ... 4x online-to-retail vs. 2x retail-to-online ... explains that the market is shifting online and away from stores ... strongly suggesting that it will be terribly hard to keep the wheels on the retail bus, long-term. You're performing these analyses, right? You know this stuff, right?